Welp…we are definitely making a third album. In less than 5 hours we hit our goal of $7,500 raised on Kickstarter! Just a friendly reminder that your Kickstarter video submissions are due Feb. 28! 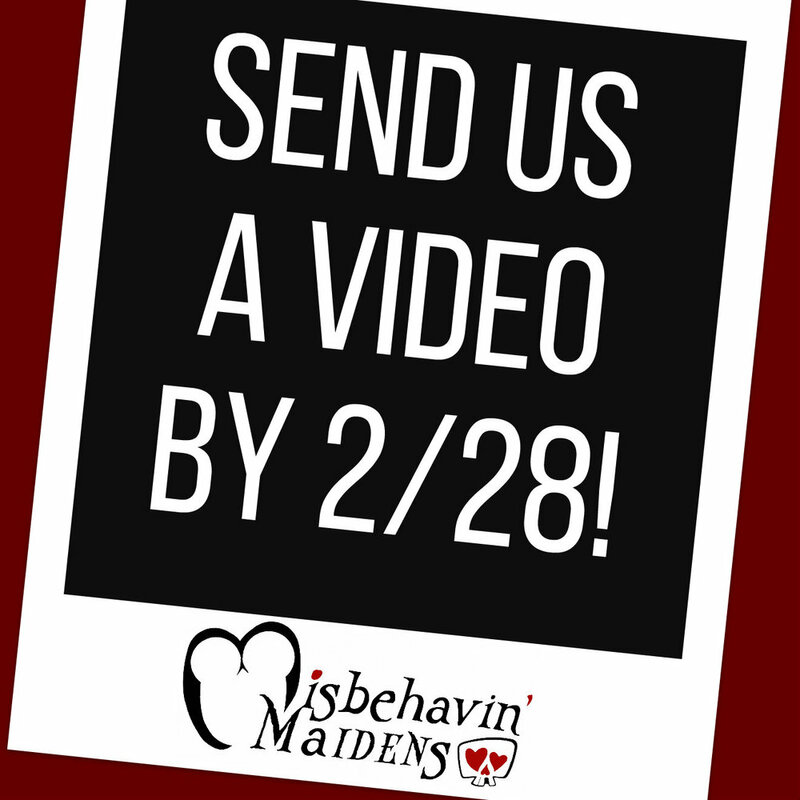 We’re looking for very short (a few seconds) videos from as many folx as possible! Details are below. 355 backers pledged $10,520 to help bring this project to life. 355 of you! That's absolutely incredible. There aren't enough thank you's in the world. We are so humbled by your support. We can't wait to bring you an absolutely stellar album. These are our "We just raised $10,520 on Kickstarter!" faces. We're going to keep you posted as the album progresses. So far, the studio time has been incredibly productive, so we're anticipating having recording complete by early March, then do mixing and fixing in March and early April, and then send the CD off to the printer in early May. If you have a moment, we'd love it if you could vote for us as Best Local Original Band in the Washington City Paper's "Best of DC." It only takes 30 seconds! Thank you all, again, so much, for your generosity, for spreading the word, for the excitement that kept us going throughout this campaign. You are amazing! Yes, it's true - over 300 of you wonderful people took us past our 2nd stretch goal! Our power level is now over 9,000! That means all our $18+ backers will get a bonus magnet AND a set of 4 coasters, PLUS we're going to be releasing a digital-download-exclusive blooper reel from our studio sessions! It's gonna be SO WEIRD and hopefully very funny. Thank you all for making this possible! The Misbehavin' Maidens will be performing at RavenCon in Williamsburg, Va. April 28-30! We're super stoked! RavenCon celebrates the genres of Science Fiction, Fantasy, and Horror. We absolutely love performing at cons, and this is the first one we'll be performing at in 2017! Again, thank you all for making this possible. We are humbled and overjoyed by your support, and can't wait to deliver a fantastic album to you in a few months. Kickstarter Update: Whoaaaa, we're halfway there! Back our Kickstarter campaign before Feb. 2, 2017! As I write this update (from the studio! with all Maidens present for the first time since we started recording this thing! ), we're on Day 16 of our 30-day campaign - just over the halfway mark. Thanks to all of you, we have a little over $8,200 pledged so far! More opportunities for us to perform at cons, more cushion to cope with the unexpected, and more new merch available to sell at our shows! So please keep spreading the word! Today is our fourth studio recording session, and as I type this, Flint is recording the principal vocals for "Rummer, the Rumrunner." It's so cool to hear her finally record this song, after I've been performing it with her for 6 years between two different bands! It sounds so fecking awesome, y'all. I can't wait for you to hear it. At this point, we've laid down partial recordings for every song on the album, which is a huge milestone. Here's a glimpse behind the curtain for organization geeks (like me). We're using an app called Trello to track the progress of each song as it goes through the process. We're slightly ahead of our plan at this point, which is fantastic. The experience from recording our first album is paying off, and our friends at Asparagus Media Studios are bloody efficient. GIANT THANKS to all of you, and to anyone we may have inadvertently missed in this list! And thanks again to absolutely everyone who has backed the project and continued to share the link with friends and online groups. Until next time, keep circulating the tapes - er, keep sharing the link! We're super excited to announce the launch of our Kickstarter to fund our second album! Keep sharing, even if we reach our initial goal. Our $5,000 initial goal will get us to a 10-song album, but we'd love to do a 12-song album, which will require additional funding. We have a couple of stretch goals set up that will get you more tracks and more merch, so stay tuned! Kickstarter Launching Jan. 3: Back Us on Day One! On January 3, 2017, at 12:01 a.m. Eastern Daylight Time, we will be launching the Kickstarter to fund our second album. Kickstarter is more likely to feature our project on their homepage if we get a large number of people backing us right out of the gate. And if we make it to the homepage, we'll get even more backers (and new fans!). This worked fantastically well for us in 2015, so we're hoping to replicate that success. BUT WHAT IF I'M BROKE? The total amount RAISED on the first day doesn't matter - just the total number of backers. So, yes, even $1 helps! Remember that you can change your pledge level any time between Jan. 3 and when the campaign ends Feb. 2, and your credit card won't be charged until after the campaign ends in February. WHAT IF I WANT TO DO MORE TO HELP? 1. RSVP and invite your friends to our Day One Backers event on Facebook. 2. Tweet/Facebook post about how excited you are for our second album with our Official Campaign Hashtag, #MoreMaidens. 3. Ask your friends, individually, to back the campaign. People are more likely to give if asked personally! 4. Know someone with a podcast or blog that would be interested in us? Tell them! We'd love to spread the word through some new channels. They can reach us at misbehavinmaidens@gmail.com. Or if you have a blog or podcast, invite people to back us at www.misbehavinmaidens.com/kickstarter. Once the campaign launches, that link will point right to it. I'M STILL CONFUSED. WHAT DO YOU WANT ME TO DO ON JANUARY 3? We want you to go to our Kickstarter (link will be posted on launch day) and pledge at least $1 to back the campaign on January 3.